The Corbin PIN-POINTtm bullet tip inserts (Cat.No. 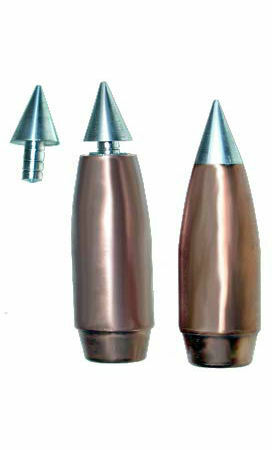 TIP-45-5) are used to make larger caliber bullets with shorter overall length than can be done with the ULD-TIP design. 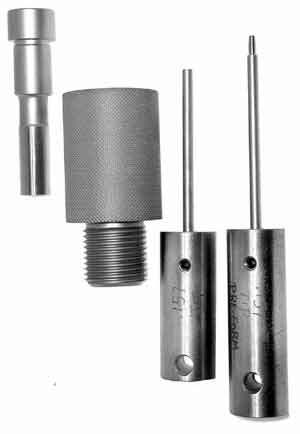 The die used for installing the tips and finishing the ogive is the same catalog number for both kinds of tips, PF-1-ST or PF-1-HT, but with the description of PIN-POINTtm rather than ULD-TIP. The 25-degree nose cone and 0.100 inch grooved stem of the PIN-POINT tip blend in a smooth hybrid ogive with a radius adjusted for the caliber. In .45 caliber the ogive is 4-S, as shown in the illustrations. 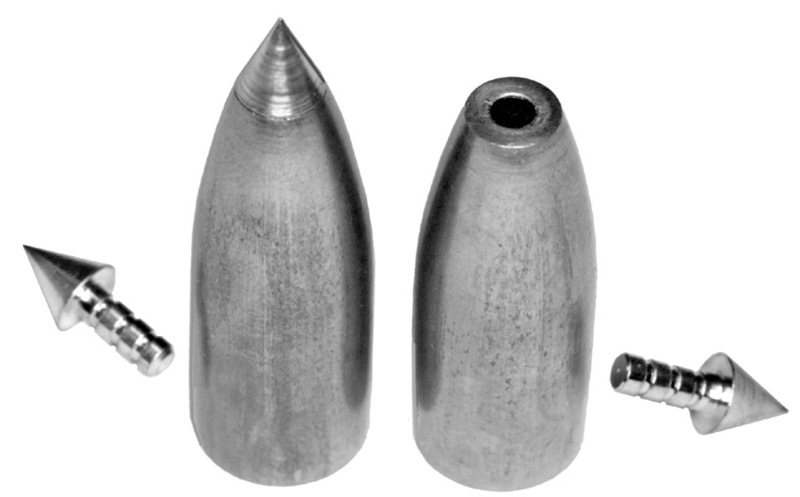 This works extremely well for lead muzzle loader bullets, jacketed .450 Bushmaster caliber, and other bullets that are longer than a typical handgun but limited by the action or twist rate to moderately short over-all length for the weight. The PF-1-ST or -HT die comes with two ejection punches (internal punches). One is the cavity-forming or T1 punch, which has a projection on the tip to make a precisely centered cavity in the lead core while the ogive is being formed. This punch is synchronized in length to the depth of the particular die cavity, which varies slightly diamond-lapped hand finished dies. To see details and diagrams explaining synchronized ejectors, select SYNC. The exact length for the punch is marked both on the die and on the punch head. 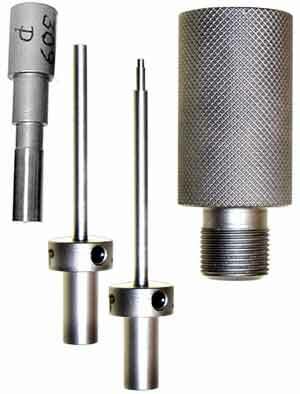 It is essential to use only the punch made for the specific die, so it will seal pressure exactly at the tip, and project exactly the right distance into the core. The rod insert portion of the punch is secured by a set screw in the punch head. It is replaceable without buying another complete punch, if needed. But replacement orders must include the sync length measurement written on the punch head, and must be used only with the matching die. The second ejection punch has a cavity shaped to the 25-degree tip angle of the nose cone. It is retracted out of the cavity area and is not critical in length to the same degree as the T1 punch. 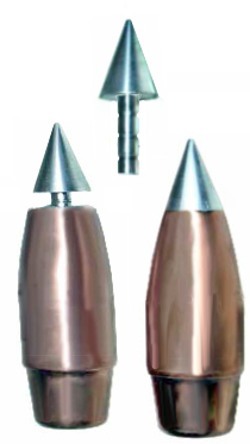 The T2 punch is used to to eject the bullet without damaging the tip, after the bullet is finished by inserting the tip and seating it with a second pass in the point forming die. The T2 rod is also a removable part, replaceable with a set screw if necessary. The punch can be damaged by allowing the tip to fall into the die off center and then forcing the bullet in behind it, which crushes the side of the T2 punch cavity before the punch is retracted out of the way. To avoid this, make sure the tip is pushed into the cavity in the end of the bullet core, and that the amount of lead core is sufficient to allow a good grip on the 0.100 inch diameter stem. Using too little core means that the T1 punch can't reach the core and form a hole for the stem. Then the stem is not centered correctly, and probably will tip to one side when you try to seat it with the T2 punch installed.